Mercedes sports a new equip slot for arrows. These arrows can be potentialed. The arrows are shown in the equipment spoiler below. The information posted here, unless otherwise noted, is gathered from the KMS version of Maplestory. 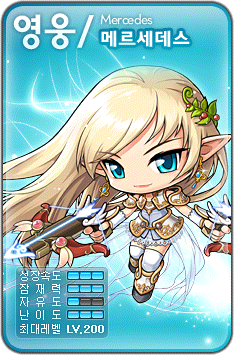 As such, information added to the KMST server will not be reflected here until those changed reach KMS. Note! Some videos are taken from unfinalized patches. The videos below should be taken as a preview of the class and should not be used for any form of damage calculation or speculation. Note! The following arrows are equippable items and can be potentialed. Description: 정령의 축복이 깃든 마법 화살이다. 전용 슬롯에 장착하면 화살 소비 없이 듀얼 보우건을 사용할 수 있으며, 잠재능력 부여 주문서를 사용해 잠재능력을 부여할 수 있다. Reduce the time of all status abnormalities by 2 seconds. Description: Shoot arrows at many enemies in front of you. Description: Permanently increase your latent potential. Increases speed, maximum speed, and provides a fixed chance to avoid enemy attacks. Description: While in mid-air, jump again to glide forward. As the skill level increases, distance traveled improves. Description: Use the force of nature to repeatedly shoot a sharp arrow. Can pierce through enemies. Description: Make enemies in front of you slide, and then knock them into the air. Enemies in the air will take extra damage. Description: Using MP, Duration: increases the attack speed of your Dual Bows by two levels. Description: Recover HP and MP from damage done to enemies. Maximum HP and MP recovered cannot exceed 10% of your max HP or MP. Description: Shoot arrows wildly at monsters knocked into the air by Charge Drive. Can only be used after Charge Drive. Description: Increases the weapon mastery and accuracy of dual bowguns. Description: Grants a chance to deal additional damage after an attack. Must have a dual bowgun equipped. Description: Permanently increases strength and dexterity. Description: 전방에 있는 다수의 적들에게 매우 빠른 속도로 다수의 화살을 날린다. 대상은 일정확률로 기절상태가 된다. Description: 점프 상태에서 빠르게 몸을 회전하면서 사방에 화살을 난사한다. 공중에서만 사용 가능하며 스킬 사용을 위해서는 반드시 120 이상의 점프력이 필요하다. Description: 성스러운 유니콘을 소환해 전방의 적 다수를 동시에 공격하고 일정시간 동안 약화시킨다. 약화된 대상은 지정된 횟수만큼 아군의 모든 공격에 추가 피해를 받게되며 보스 몬스터에게는 추가 피해 적용횟수가 2배로 적용된다. Description: 바람의 힘으로 공중에서 빠르게 하강하면서 범위 내의 적 다수를 동시에 공격한다. 대상이 약화 상태일 경우 추가 데미지를 받는다. 스킬 사용을 위해 120이상의 점프력이 필요하다. Description: 영구적으로 적의 공격을 추가 회피할 수 있게 되며, 스킬 사용 시 불의 정령의 힘을 빌어 일정시간 동안 공격력을 대폭 증가시킨다. Description: 정령의 힘을 빌어 일정시간 동안 자신에게 물의 보호막을 발동시킨다. 보호막은 받는 데미지의 일부를 흡수하고, 상태이상 내성과 모든 속성 내성을 증가시키는 효과가 있다. Description: 일정 시간동안 정령 기사들을 소환하여 전투를 돕게 한다. 정령들은 사용자가 공격한 적을 공격하며, 적이 죽을 때까지 공격을 멈추지 않는다. Description: 양손의 듀얼 보우건으로 전방의 적 2명을 조준사격하여 즉사시킨다. 단, 보스 몬스터는 한방에 쓰러뜨릴 수는 없으나 치명적인 데미지를 줄 수 있다. Description: 일정시간동안 고대 정령의 가호를 받아 데미지와 HP를 증가시키며, 영구적으로 포텐셜 파워의 회피 확률을 상승시킨다. Description: 정신을 집중하여 상태 이상으로부터 벗어난다. 단, 일부 상태 이상 효과에는 적용되지 않는다. Description: 공격 시 일정 확률로 적의 방어율 100%를 무시한다. 보스몬스터에게도 동일하게 적용된다. -- Added a notice to the top of the module stating that this module is dependent on information from KMS and not KMST. As such, this module will only be updated once information hits KMS. Last edited by Fiel; 2011-07-17 at 12:15 PM. I'm still not liking how the Dual Bows look. THEY HAVE 165 MAX SPEED???? Charge drive seems like FATSUS, but in one move. I jelly. Is it Leap tornado or Leaf tornado? You put both. So the main stat for Mercedes is STR, but the Dual Bows have a rediculous amount of DEX needed to equip them. I don't get it. Is it to make them balanced? Thanks for catching that. I will be fixing various other translation issues/otherwise as the night goes on. Primary = main. Primary stat is DEX. No problem, but I was actually convinced STR was the main stat. I was going to make one because of it, but oh well. I still prefer Cannoneers over this and also waiting on Demon Slayers. I also missed a comma for Unicorn Spike the first time through. Just something for consistency. Any thoughts as to whether the "status effect" Unicorn Spike gives should be renamed? Weakening is already the term for being unable to jump which is not what this does, though the term used literally in the description states it makes the monster weaker. "Permanently increase your latent potential. Increases speed, maximum speed, and chance to avoid enemy attacks"
as it should be a an increase to the evasion rate that's calculated from your avoid stat. i.e. you have x avoid that gives you y% chance to evade enemy attacks. Maxed Potential Power gives you 1.2y to evade enemy attacks, as opposed to y + 20% like Fake from 4th job Thieves. Unless the skill is utterly broken. Soul Purify doesn't heal HP or MP anymore and was renamed. -- Added other weapons recently placed in KMS. Why do i get the feeling that even the Male mercedes is a female ? its just made so it can wear (M) stuff but still, is a female ? Eh, what gives you that idea? The effeminate hairstyle? The name that means lady of mercy? No, seriously. Male Mercedes looks totally female. It's an elf, what did you expect? this. i mean. even the cutscene where she freezes shows a female mercedes. IGN: Been Hacked. Don't bother. Delicious trap~~~ I think if I ever make a Mercedes (if GMS survives until they come out), I'm definitely making a male one. Ofc, Aran is supposed to be male, but is shown as a female several times (especially in KMS, who seem to not have problems with gender confusion). Well, doesn't the official canon have her described as the "Queen of the Elves"? That in itself would be enough to make Mercedes a female.